Photosynthetic bacteria and plant have an abundance of molecules that interact with visible light. 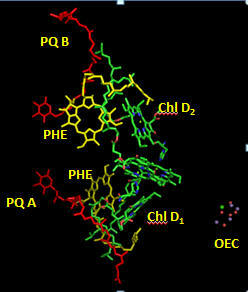 The main one found in PS2 is chlorophyll a whose structure is shown below. In PS2 there are 35 chlorophylls. Seven of them use water for ligand to the Mg ion, while the rest use His (as shown in the example above). Why might there be so many chlorophylls in PS2? The chlorophylls (Chl) are arranged in a very specific arrangement as shown below. Two special chlorophylls, ChlD1 and ChlD2, accompanied by partner chlorophylls, PD1 and PD2 that are coplanar to each, are found near the OEC and are the key chlorophylls that turn OEC into a powerful enough oxidant to oxidize H2O. These 4 chlorophylls are called the reaction center. 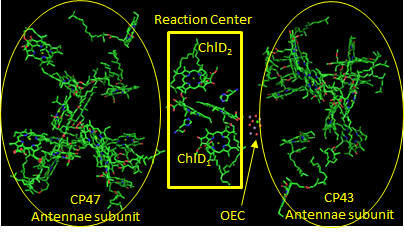 What might be the role of chlorophylls in the “antennae” subunit “activating” the reaction center? Now we will consider the key process: how the reaction center chlorophyll becomes nature’s most powerful oxidant. Why might molecule “b” have a lower excited state energy? Show by adding arrows and moving the given electrons in the above diagram how excitation of molecule a can lead to the final state shown to the right. What would be the charge on molecule “a”? Molecule “b”? Which would might be a powerful oxidant? Next we must consider how the oxidant made at the reaction center, denoted as P680.+ leads to changes in the OEC as illustrated in the S0-4 oxidative intermediates in the Kok cycle. Based on the figures above, which chlorophyll in the reaction center, ChlD1 or ChlD2 represents molecule “a” in the top left figure? Molecule “b”? What might be the role of the coplanar partner molecules PD1 and PD2 ? In reality, quantum mechanical calculations show a coupling between ChlD1 or ChlD2 such that 80% of the positive charge and radical character is situated on ChlD1 and 20% is on ChlD2.) 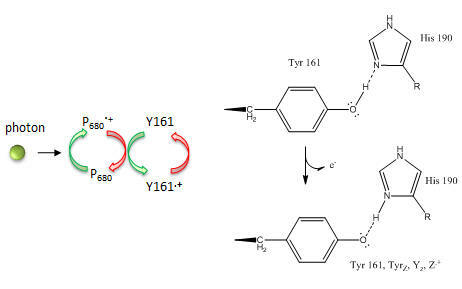 How does Y161.+ lead to sequential transfer of “oxidizing” equivalents to the OEC? How is Y161 regenerated so that catalysis is continued? The last feature to consider is the fate of second member of the reaction pair represented by molecule “b” to the right. It must also be regenerated. What must is lose to be regenerated? Cofactors bound in the reaction center allow a path for electron flow. 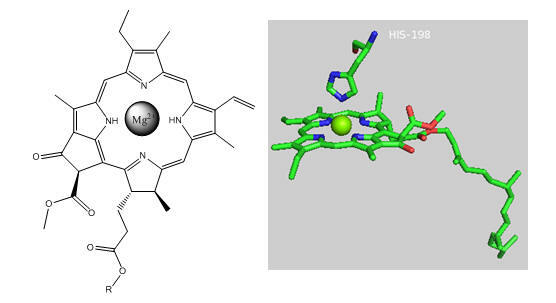 These include pheophytins (PHE) and plastoquinones A and B. Pheophytins are chlorophyll a molecules without the central Mg ion. The structure of plastoquinone is show above. Trace a likely path for electron flow from molecule “b” to Phe, PQA and then to PQB (with the realization that quantum mechanical coupling and tunneling occur in this process so that the process are coupled).